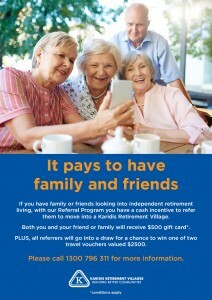 If you have family or friends looking into independent retirement living, with our Referral Program you have a cash incentive to refer them to move into a Karidis Retirement Village. Both you and your friend or family will receive $500 gift card*. PLUS, all referrers will go into a draw for a chance to win one of two travel vouchers valued $2500. Please call 1300 796 311 for more information or download a form here. To claim the $500 gift card, the Referral Form must be completed in full and be signed by the referrer. The referee must not be an existing prospect or on Karidis’ Retirement Villages’ database. Payment will be made 30 days after settlement is complete. Offer is not valid in conjunction with any other offer or incentive. Referrers will go into an annual draw to win 1 of 2 travel vouchers, valued at $2,500 each. The travel voucher will be valid for 12 months from issue, and will not be transferable or able to be exchanged for cash. The annual draw dates will be announced separately.